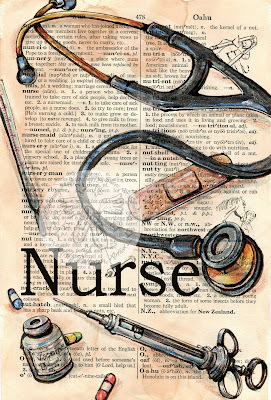 This drawing is intended as a tribute to nurses. I think everyone at some time or another has been under the care and compassion of a special nurse. Growing up in our small town, there are three nurses who stand out to me, Betty, Betty and Charlotte. These terrific ladies were there when our family needed them and they always did far more than give a shot and follow a doctor around a clinic. In fact, there were a number of occasions that a doctor might leave, retire or in one case, pass away, that we would follow our nurse to her next clinic. We trusted our nurse so much that we'd patronize whom ever she had decided to work for. These ladies looked out for us - and although one Betty is no longer with us, Betty and Charlotte still are close to our family. Currently our rural hospital is struggling like so many in remote areas. I think a lot about the staff there and how much we admire and need them to be supported. So here's my salute to a special profession that serves us each and every day.